Ok. I’ve used Mandelbulb 3D for a while. I like generating very large fractal images, and it has a Big Render function to facilitate large projects. Using it, you can split a large image into a grid of image tiles, each one taking far less time to render than if you tried to render the whole thing all at once. Several years ago, I even created a Photoshop script for automating the assembly of the image tiles that the Mandelbulb 3D Big Render function generates. I did this because I often generated 100 or more image tiles. Manually assembling them is not that big of a task, though it does quickly become tedious. It seemed a script would be a perfect solution. Just plug in the image tiles and let Photoshop do all the work. So, I built a script to do just that. It worked very well and I was happy. Then my computer suffered a catastrophic hard drive failure (the crash was unrelated to the script). No, I did not have a current backup. It was stupid, I know, and I suffered for it. Jump to a week ago. I decided I wanted to write the script again. Did I remember how I did it? Of course not. I had to dig in and recreate the wheel. Actually, I bastardized an existing PS script – Load Files Into Stack. It already had the functionality of the window, importing the files, etc. All I needed to add was the logic to align the layers (generated from the imported image tiles). Done. I even made it so that it will detect if you chose single file numbering or XY (Column/Row) file numbering and process them accordingly. If you open it in a text editor, you will see that I only added a bit of code and it is not very complex. Just some regular expression matching, simple math, and a couple of for loops. I know few people will have a need for something like this. For those that do, here it is. As with any download, scan it before you extract it from the zip folder. I try to keep my site secure, but nothing is 100% safe. This script is compatible with Photoshop CC 2015. It may work with older versions of Photoshop, but I have not run any tests. I offer no warranties or guarantees. First off, this is a first draft (second, if you consider what I lost a few years back). So, there could be bugs I have missed. Second, this should work with any sequential image tiles, not just those generated from Mandelbulb 3D. First, you will need to extract the jsx script file from the zip, and save it somewhere on your computer. It does not matter where, as long as you can find it later. Of course, you will need to have generated your image tiles. This is not a Mandelbulb tutorial. If you want to learn how to use its Big Render function, try a Google Search. So, you’ve done your thing in Mandelbulb. Now, open Photoshop. In the Open window that appears, navigate to wherever you saved the extracted jsx file and open the file. First, you will need to click the Browse button and select all of the image tiles. Note: Only select the image tiles. If you want to compile the Zbuf files, that is done separately, using the same methods. However, the script will not currently process both the image and Zbuf files in one pass. I think I can add that feature later. Shouldn’t be terribly difficult. 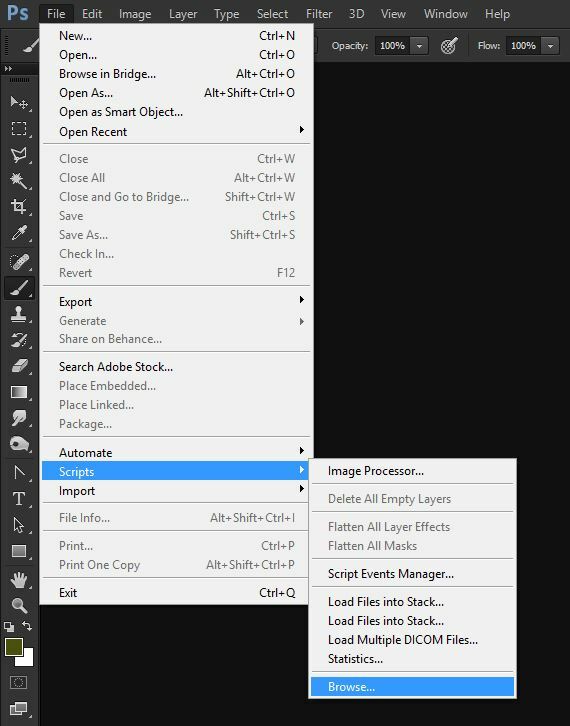 After your files have loaded into the window (it could take a few minutes if there are a lot), make sure you click the “Attempt to Automatically Align Source Images” box. At this point, I have not been able to make that box checked automatically. If you forget, then your tiles will load but will not be aligned. They will just be stacked in the center of the document. In the Rows & Columns section, specify the number of Rows and Columns. This should be the same as you entered into the Big Render window in Mandelbulb. If your tiles were created with some other software, the logic is the same. How many rows and columns of image tiles are there? Enter that here. 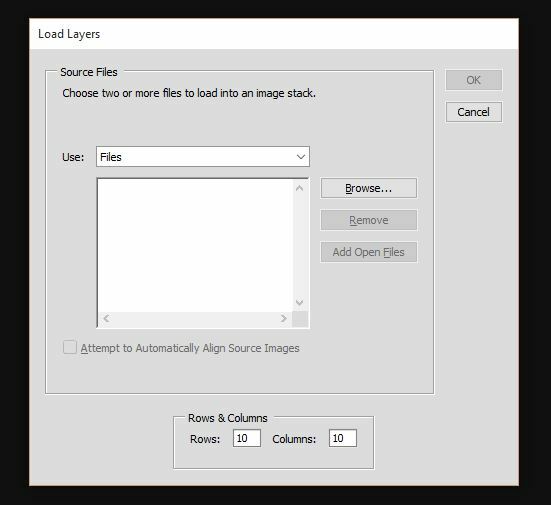 When you have everything set, click OK. Photoshop will begin loading all the tiles as layers in a new document. Then, it will begin placing each tile in its proper position. Sit back, go get some coffee, relax. Depending on the number of image tiles and the size of the tiles, it could take a little while. Another note: Just because you can do a thing does not mean you should. Yes, you can create a Big Render that generates upwards of 10,000 image tiles. However, odds are very good that Photoshop will crash long before they are all loaded. Believe me, I know. I tried. I have 32GB of Ram and I still crashed PS. Of course, the resulting image was going to be around 21,600 x 14400 pixels. Depending on your memory and the size+number of image tiles, I expect that you should be safe with a few hundred tiles or less. Allow importing of the regular image tiles, as well as the Zbuf tiles, in one pass. Add options to either Group the tiles or to create a Smart Object. I am open to suggestions. I make no promises about what I would be willing (or able) to do, but I am open. Just leave a comment below and tell me.